Mellady Direct Marketing provides world-class mailing service for the direct mail industry. Mellady Direct Marketing is able to provide value to your business through our mailing services in two ways. First, our expert consultants will show you how to define and target your audience, design the right message and time your delivery to achieve the impact and recall that only great direct marketing can achieve. Second, we put technology to work for you so you can send out your mailing on time, at the best rate. This focus on your entire direct marketing campaign is why we can provide the best mailing service results in the industry. We strive to save you money, provide the best service at every stage of your project, and help your company see the return on the direct marketing campaigns you send out. Even if you have a complicated direct marketing campaign with multiple components, Mellady Direct Marketing is ready to take care of all of the details for you. Get the most out of your direct mail marketing. Receive a free quote today and see how years of experience can help. Click here to start. If you are tired of inefficient mailing services then look no further than Mellady Direct. Our quick, efficient and economical direct mailing services will add value to your business. We will provide you with an expert team and state-of-the-art technology to send out your mailing right on time! Mellady Direct Marketing provides you with the best value available for your mailing needs. 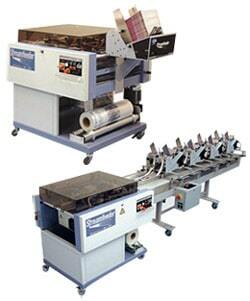 Mellady Direct Marketing has our own QuickWrap™ polybag wrapping system. This provides a way to help improved brand recognition, lower postage costs, and increase the design flexibility of your direct mail pieces. Polywrapping is ideal for applications that call for several components to be mailed together, such as magazines, mailing publications, brochures, catalogs, books, product literature, annual reports and more. The machine forms a clear bag by feeding poly material from a continuous roll, forming around the items to be enclosed and sealing down the center and at each end. Unlike envelopes, the resulting clear bag allows recipients to see the enclosed materials. When people recognize something, they are more likely to open it and read it. The poly wrap material is much less expensive than paper envelopes and also much lighter, which may reduce postage costs. And, unlike envelopes that have been purchased to accommodate exact specifications determined during the planning stages of a job, polybagging allows customers to easily make changes to a project midstream if necessary. Mellady Direct Marketing is pleased to offer this option to our clients, who have already found it to be an extremely effective tool for direct mail campaigns. Mellady Direct Marketing proudly serves Santa Clarita, Valencia and all the Greater Los Angeles area. We also gladly welcome Nationwide Direct Marketing customers. Please contact us today and let us create mailing service solutions for you.